Nollywood actor Nkem Owoh, veteran television and film actress Bukky Ajayi, television director Zainab Bewell, pioneering Nollywood producer Okechukwu Ogunjiofor and renowned broadcaster and Permanent Secretary, Lagos State Broadcasting Corporation, Lekan Ogunbanwo including the cast and crew of MNET's Jacob's Cross are to be honoured at this year's BOBTV, Africa's premiere film and television programmes expo scheduled to hold from March 8 to 12 at the Ladi Kwali Conference Centre, Sheraton Hotel and Towers, Abuja. Recognising hardworking professionals who have contributed to the growth of the movie and television industry in Nigeria, has become an integral part of BOBTV. “We often fail to recognise the worthy contributions of our people while they are alive. Most times, it's only after they die that we remember the good work they have done. We believe that this isn't the best way to encourage people to give their best, and certainly, lack of recognition discourages up-coming talents to put in their best,” BOBTV Festival Director, Amaka Igwe, explains. 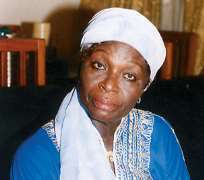 Blockbuster learnt that Nkem Owoh was chosen in recognition of his immense talent and skill as exhibited in various characters he has brought to life in his long acting career. Bukky Ajayi has achieved veteran status as an actress of note. “Having put over four decades into stage, television and movie industry, she is one of the few actors whose exemplary careers remain a reference point, as well as an inspiration to many people,” Igwe remarks. Lekan Ogunbanwo is credited with revamping the Lagos State Broadcasting Corporation, the results of which can be seen in Eko 89.75FM, the new Radio Lagos, 107.5FM, the all Yoruba TV channel Amludun and the much improved Lagos Television, LTV. “We acknowledge also his contribution to the growth of Nollywood particularly his support of the Yoruba film Industry,” Igwe says. The pioneering effort of Okechukwu Ogunjiofor has led to a phenomenon that has attracted respect and criticism in equal measures. Zainab Bewell has directed for television for over two decades. One of the leading lights of the creative industry in the north, she has also worked international and continues to bring quality works to the audience even today. The cast and crew of Jacob's Cross are being awarded for bringing a gripping television drama to the African audience. With excellent production values, superb acting and a storyline that navigates the borders of Nigeria and South Africa, Jacob's Cross is much admired by its teeming fans and reinforces the fact that excellence can be achieved in productions on the African continent. This year's recipients join the prestigious “Best of the Best” honours list that includes Dr. Raymond Dokpesi, Mr. Peter Igho, Ms. Liz Benson, Mr. Andy Amenechi, Sam Loco Efe, Chika Onu, Dr. Umar Farouk Jibril, Antar Olaniyan and Engr. Tony Ikoku.